Addiction experts are hoping to better educate the public about the nation’s opioid epidemic to help reduce the number of deaths. 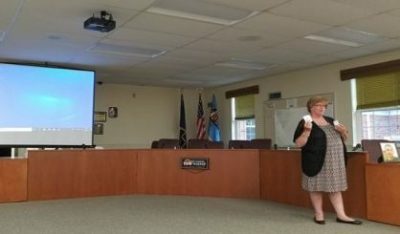 At a forum at St. Joseph Township Hall Wednesday, Berrien County Health Department Substance Abuse Prevention Specialist Kerri Teachout said opioids represent the “deadliest drug crisis in American history.” She told us a common way someone gets their hands on an opioid is via theft. “The simplest way a person can help is to do an inventory of their medicine cabinet, and whatever they’re not using or whatever has expired, the best thing to do is drop it off in one of the 14 disposal locations we have in Berrien County,” Teachout said. Teachout says opioids include OxyContin, codeine, Darvocet, Vicodin, morphine, and heroin. Also speaking at Wednesday’s forum was Amy Jonatzke with Families Against Narcotics, who talked about the death of her son by addiction. She wanted everyone to know help is available, and you can learn how to administer anti-overdose drugs. The health department and Families Against Narcotics are available to anyone with questions. Another organization that offers help is Voice.Change.Hope. Pictured: Amy Jonatzke with Families Against Narcotics at Wednesday’s meeting. Community members are encouraged to continue turning in unused medications at these 13 local prescription disposal sites (collection sites in Berrien County can be located on the community resources tab at www.voicechangehope.org. Collection sites across the state of Michigan can be found by visiting www.dea.gov, and below are some examples in Berrien County.